This animal print piece from the brand Proudrace has got to be the perfect tank dress. Animal print, perfect dress length, lightweight silk jersey fabric― it's definitely a steal for only P1,255! Another favorite is this mullet dress from Collective.com. I love the tribal print, the cut-out back panel and the scoop neckline. It also comes in yellow, jade and orange. The best part is, it's only P595! Is it your first time shopping on ZALORA? Don't fret because they provide an easy platform for online shopping. Not only do they offer a wide range of payment options, from credit cards to G-cash, Paypal, bank deposits, and for Metro Manila residents, cash on delivery, they also offer FREE shipping and FREE returns within 30 days. With their own fleet of couriers, or "Z Riders" for the Metro Manila area, delivery time is around 3 hours. Nationwide, it is 1-2 days. 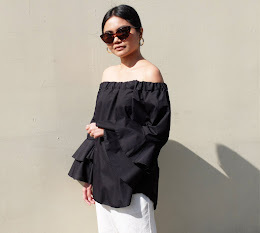 As a special treat for my readers, you can get a 5% discount on any ZALORA order by using the voucher code AlexaMartin12K upon check out for every minimum purchase of P500.